In anticipation of warmer weather (which is nowhere in sight in Melbourne right now - all we get is rain and cold), I'm trying to get my dull looking body looking polished so I don't scare the public when I finally put on a skirt and bare my legs without hiding it under tights or pantyhose. So on top of my normal moisturising routine, I've decided to add in a dry brushing step to fast track the process of getting soft glowing skin for this upcoming summer when it finally arrives. improved appearance of dimply skin and cellulite. Firm & dense natural fibre bristles that is evenly cut on one end and rubber nodules on the other to give body an invigorating massage. Nice sturdy long handle with a rubber grip allows easy reach of backs and derrières. Great for prepping the skin for that faux tan or to remove it when it becomes patchy and has seen better days. 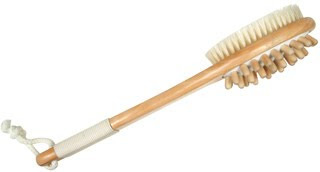 I rarely use the nodules as I don't find it give a great massage and it is hard to grip with the bristles on the other side, but I <3 the brush side to brush my legs and body. I definitely notice that skin is less dull and not as scaly or flaky as before. After brushing for about 2 minutes, it can leave your skin slightly red if you apply too much pressure when brushing, but that quickly goes away once you jump into the shower - besides, firm brushing is better for the circulation! Helps remove sebum and grease from bacne prone skin and unclog pores and clear up blemishes- bikini body, here I come. Body lotions and moisturisers sink into skin faster and works better than ever. I wash this brush once a week in soapy water and hang it out to dry to ensure it stays clean and bacteria free. IMHO, this tool is better than most body scrubs out there and is definitely worth having look if you have not yet considered adding dry brushing to your body care routine. Rating: 9/10. RRP A$14.95 at Priceline, Myer and leading pharmacies. Oh lovely! I've never tried dry brushing but my legs are looking rather icky at the moment so might give this a go! Maybe if I move somewhere with a larger bathroom, I'll have more luck with it staying dry! I'd quite like to purchase this otherwise. @Melbournite - Yes, it can get damp in non-ventilated bathrooms, buy one of those suction cup hook things and hang it on the other side of the bathroom rather than inside the bathtub to try and keep it dry.